One ball per group of three players. Warm up with pass and move, then introduce becoming a defender: On the coaches&apos; yell of "GO", the last player who passed the ball(labeled player 1) immediately becomes a defender and cuts off the pass to #3. 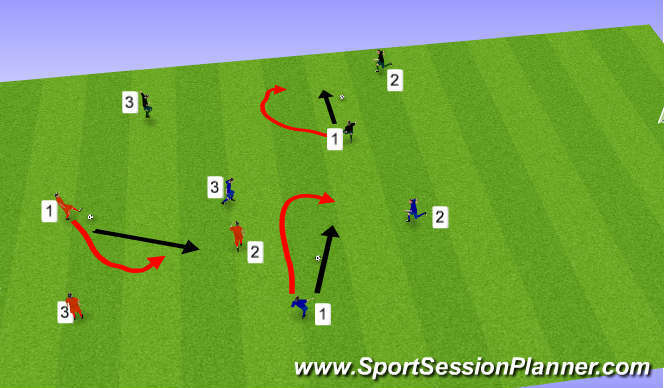 Players play 2v1 until the ball is taken by #1, when they return to pass and move, no defenders. Posession: Coach the necessity of moving before receiving a pass and immediately after delivering a pass. Defense: Immediately work to cut off pass to #3, then close down #2 while maintaining their position in between # 2 and 3. 3v1 Keepaway in a small square. The player that loses the ball takes the pinnie in his/her hand and becomes the defender when the ball is put back into play. -defender should look to immediately cut off one pass and make the ball movement become predictable. -attackers should always look to pass/move into a new space. Player with the ball should have teammates left and right to be able to pas the ball away from the defender.